PodioIndia is undergoing site reorganization - we will be back soon with new content. In the meanwhile enjoy the archived features. 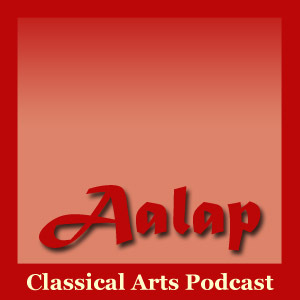 A monthly podcast featuring Indian Classical Artists. As the name suggests, Aalap is the introduction in Indian Classical Music - it is a glimpse into the musical journey that lies ahead in the performance. Alaap also implies conversation. In this series, through hosts Piya and Deb, the artists share their world of Indian Arts with you. Please share your thoughts and comments as well. Write to us at alaap at podioindia dot com. 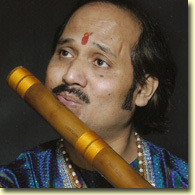 We continue our conversation with Pandit Ronu Majumdar, the ace Indian bansuri player. According to him, bansuri is the “sound of nature” and he tries to leave his audience with an earthly feel by playing folk pieces. Adept at playing different categories of music, be it pure classical, fusion or world music, Ronuji, however, cautions against mixing genres in concerts. He goes on to explain the challenges faced by the music world now, with the hype surrounding TV contests and the lack of sponsorship for good music. We also talk about his film music sojourns, and he fondly recollects his association with R.D. Burman and Salil Choudhury and his fascination with the Lata Mangeshkar classic O Sajna. He also talks about his music school in Chicago, Sadhana and we leave on a note of optimism, with hope for furthering the rich Indian tradition. In the next episode our aalap continues with Pandit Vishwa Mohan Bhatt. Pandit Ronu Majumdar, the ace Indian bansuri player, has enthralled audiences worldwide through his soul-stirring performances. He is equally at ease from pure Classical, fusion, light compositions to world music. Now on a concert tour of North America, Pandit-ji talks to Aalap in an exclusive interview about his early years, on his gurus and explains the difference between western concert flute and the Indian bansuri. Ronu-ji also emphasizes on the importance of Aalap while rendering Indian ragas and outlines how he lays out his concerts. He has many albums to his credits, but picks out the few close to his heart. In the next part, he talks about the challenge faced by classical music, his school in the US, his colleagues, his family and shares some little known anecdotes. Enjoy this episode and stay tuned for the next. The Indian Music Podcast with a unique content. Featuring songs, interviews and commentaries on various aspects of Indian music. Join hosts Piya and Deb in a musical journey around the world and listen to fresh voices, bollywood stars and US concert info. We want you to be a part of this Podcast too. Send in your comments and your songs. At Awaaz Anjane, we want the unknown to be heard. As 2009 unfolds with new hopes, we wish to thank you for your support and wish you and your family a very happy new year. Back in May 2008, we had introduced to you Smita Ravichandran from New York and Akshay Hari from Pittsburgh– two high-schoolers with dreams of making it to Bollywood. Since they heard each other in that episode, they started collaborating online and recording duets. In this episode, we talk to both of them to know about their passion for music, their aspirations, their academic goals and preparations for their first joint live performance. Akshay and Smita are performing on January 24 in Pittsburgh in a fundraiser to aid the Mumbai tragedy victims. They share a few of their lovely duets (Hey Shona, Mujhe Haq Hai and Khuda Jaane) with us and invite all of you to this concert and help this great cause. Awaaz Anjane wishes all our listeners a very happy Diwali. In this special episode, we bring to you excerpts from our conversation with Rex D’Souza - finalist in the 2005 Fame Gurukul contest. For long a frontrunner in that contest, Rex narrowly missed the crown. But his eversmiling face, romantic voice and penchant for melody left a mark in the audience’s hearts. His live concerts are a treat and he thrives in the interaction with the crowd. Rex talks to us about his early years, earning Rs 50 in his first show to where life has taken him now. Shows around the world, K for Kishore and Jo Jeeta Wohi Champion contests have been a part of this journey so far. He also talks about his recent initiation into classical vocal training and the upcoming Bollywood playback projects. Our best wishes, Rex! In this episode, we introduce you to Shaoni Mitra – the winner of TVS Sa Re Ga Ma 1996. As Shaoni says these were real early years for the mega-successful contest, with Sonu Niigaam beginning his anchoring stints and musical stalwarts taking on the role of judges. 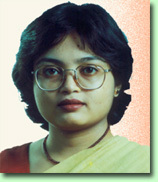 Shaoni, with her classical background had fared well in all the rounds and eventually won the best female singer award. She has been busy since doing radio, TV, playback singing and live performances. Her favorite singer is Asha Bhosle though she enjoys Lata Mangeshkar songs as well. We get a sample of the range Shaoni possesses as she takes us through ghazals and film songs with equal aplomb. 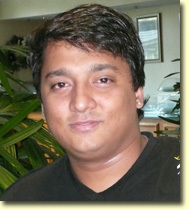 In the next episode, we will talk to another talent hunt contest participant – Rex D’Souza – finalist in Fame Gurukul. Its Season 3 now! We are so glad to be back after the summer months, doing what we like most – bringing to you our favorite musical talents. During our summer hiatus, in a unique webcast, KavitaChibber.com celebrated Sonu Niigaam’s birthday. Singers from around the world sang their favorite Sonu Niigaam songs along with a wonderful accompanying article by Kavita Chhibber. We are proud to have her as a special guest in one of our earlier podcasts. In the birthday webcast, some of our very own Awaaz Anjane stars (Akshay, Azam, Deblina, Des, Elmar, Santosh, Soumitra and Vidyu) took part and received comments from the icon singer himself! In this season-opener episode, we share with you highlights of their songs and read out Sonu Niigaam’s responses. Enjoy this episode. And if you are around the Columbus, Ohio area, do visit us at the India Festival this Saturday, Sep 20, 2008. (c) 2006-09 Fantast Media LLC. All rights reserved. We would love to hear from you. Let us know how you like this podcast and what songs we can sing for you. Now you can listen to Awaaz Anjane from any phone. 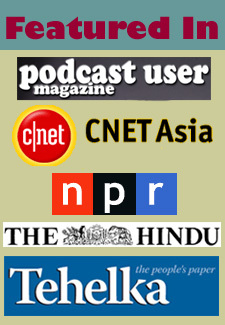 The following performers have been featured on our podcasts. We would like you to be a part of this growing list. Send us your song, composition or commentary on Hindi music. Record your song and encode in 128k MP3 format. Please limit your recording to eight minutes max. Send the file to YourGeet at gmail dot com. Include in your mail your name and where you live. Also include original song information (singer, movie etc.) and your source of accompanying music. All submitted audio material become the property of PodioIndia and may be used in its shows and website. Your information is collected solely for the purpose of improving our podcast. We do not sell, rent or use your personal information in any other format either directly or to a third-party. Submitted songs may be edited for length. PodioIndia is not responsible for copyright monitoring of submitted songs.